A dental implant is a surgically placed component that can replace your missing teeth. Implants feel natural and restore the function and appearance of your teeth and smile. Dental implants provide patients with a strong permanent solution to missing teeth. Dental implants are man-made structures that replace your missing teeth. These implants restore the function and appearance of your teeth and smile, giving you a permanent solution to missing teeth and dentures. If a tooth needs to be removed or has been missing, a dental implant is placed in that spot of the missing tooth. It is placed down into the bone. Your body will then “grow” bone around the implant. This process is called “osseointegration”. Dr Hill has been placing implants for over a decade, and uses the I-CAT FLX V17 (or 3D cone beam scan) that will show the patient’s complete bone structure. It is important to place the implant with the proper angulation and proper size for the best long-term results. Planning the precise placement position, as well as the number of implants (if multiple teeth are missing) is key to the final success and stability of the dental implants. Biomechanical forces, such as chewing and grinding forces need to be highly considered and are a significant in the total success of your implant. When you see Dr. Hill for dental implants, the process may begin with teeth extractions. If you already have missing teeth or are having an extraction, a bone graft, in addition to the implant, may be needed to restore your jawbone’s strength and stability enough to hold your dental implant. A complete 3D scan will be able to let Dr. Hill know for sure your existing conditions and what is required for full long term surgical success. With today’s high aesthetic demands, not only are form and function important, but also the final look of the dental implant crown. We all want a crown that looks like a real tooth, not a crown! 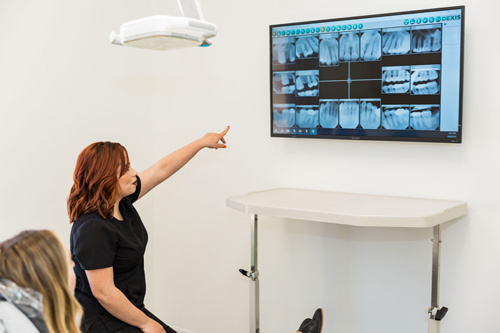 Dr. Hill highly understands this and incorporates the use of the dental X Guide Navigation technology. It allows Dr Hill to place the dental implant in the precise area, angulation, and depth to correspond with the final pre-planned aesthetic crown placement, all in real time, as the implant is being placed. After the implant is placed and fully healed, an “abutment” or fixture that fits into the dental implant will be attached to the implant and create a place for a dental crown to sit upon. The final restoration (a crown or a bridge, depending upon how many implants are being restored) can be either fixed, where a person cannot remove the teeth from their mouth, or removable, where they can remove the prosthetic. In each case an abutment is attached to the implant fixture. If you think you could benefit from dental implants, call the Art of Dental Wellness today to schedule your initial consultation or go online to book your appointment.